Spring break is not the only exciting thing in March. Every year, from the second week of March through the first week of April, millions of people enter into “madness” over the NCAA’s Division I Men’s Basketball Tournament. March Madness is a cultural event that far exceeds the boundaries of a normal sporting event. It causes adrenaline rush, attracts media attention and surely creates a whole lot of revenue for the NCAA. The event tipped off on Tuesday. Even if you’re not a basketball fan, there’s a good chance you might get invited to fill out a bracket. But how do you sound smart about March Madness? You’ll have the answer by the time you finish reading this article. So first, how does it work? Sixty-eight teams make up the tournament, and there are two ways a team can make the tournament: automatic bids and at-large bids. Half of the teams enter the tournament with an automatic bid, which is given to teams that win their conference tournaments. The NCAA Selection Committee gives 34 at-large bids to teams that did not win their conference tournaments, but deserve to be in the tournament based on their regular-season resumes. Teams in each region then enter a single-game, sudden-death elimination process with the higher seeding teams facing the lower seeding teams. For instance, the No. 1 seed teams will play against the No. 16 teams. It might seem brutal, but rules are rules. The field narrows the number to 32 teams after the second round, then to the “Sweet 16,” the “Elite 8,” the “Final Four” and finally, the championship. As a tradition, the championship team gets to cut down the nets and do what they want with them. The NCAA streams games online, but it requires that you have to have cable service subscription. Many games are also broadcast and televised on CBS, TNT and TBS. The brackets are your personal predictions about winners of each game in the tournament. Each year, millions of people rack their brains to find the perfect bracket, either in office pools or in official events held by various websites. There are two main strategies to people use when filling out the brackets. You can either pick the popular teams, or go with your favorites. Generally, popular and widely favored teams have a better chance of winning. However, each year, there will always be a lower seeding team that comes up on top and upsets the famous teams — these teams are called the “Cinderella” teams. For instance, No. 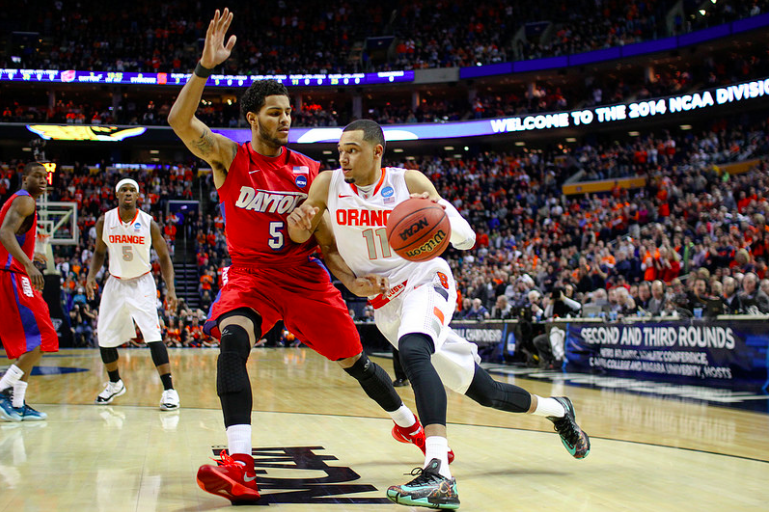 11 seed University of Dayton reached “Elite 8” in last year’s tournament, beating No. 6 Ohio State University and No. 3 Syracuse University. Therefore, the bracket is very unpredictable. Fun fact: you are more likely to win both Mega Millions and PowerBall in the same week by purchasing just one ticket than predicting a perfect bracket, CNN reported. The chance of getting a perfect bracket is 1 in 9 quintillion. So, good luck, and have fun filling out your brackets.